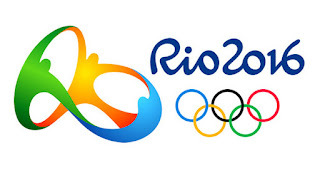 The logo of the Olympic Games at Rio de Janeiro in 2016. My daughters and I have been avid followers of the Olympics for...I guess it started with me, even before we became a family. Hubby and I could not afford a television. Yes, they had televisions instead of flat screens back then. Anyway, the Olympics games were due to start and I really wanted to watch them. Sad to say, this was even before live streaming on the Internet. Yes, it was a pathetic case. My mother-in-law, out of desperation to get some peace, loaned us her portable kitchen set so I'd watch the games at hubby's and my apartment. In all of my viewing years, I cannot recall there ever being a refugee team before. This year, the International Olympic Committee approved ten refugee athletes to compete in the games. Due to unrest in each one's homeland, these men and women did not have a country and therefore would not have been able to compete. The IOC created the refugee team just for them. These athletes didn't have a country flag either, yet they represented several countries. Each refugee athlete has a story to share. I appreciated the inclusion of these amazing stories in the broadcast of the Olympics along with other olympian stories. One particular refugee olympian stood out to me. In comparison to other swimmers, fifteen-year-old Yursa Mardini did not qualify for the final round of competition even though she won her qualifying heat placing 41 out of 45 competitors. To me, though, she won a far greater race. Yursa's Syrian home had been destroyed. She and her sister fled to Lebanon then on to Turkey where they found refuge on a boat bound for Greece. While motoring across the Aegean Sea, the engine died. The small raft, rated for seven passengers, drifted in the water with twenty people. Yursa and her sister, Sarah, discussed the problem. They didn't want to remain on a stranded boat. They were trained swimmers and could have left the boat and passengers to attempt a swim across the sea to the next shore. Instead, the girls dove into the water and pushed the boat for three hours until the craft and all twenty passengers reached the safety of a Grecian beach. This was bigger than a gold medal race. It was the race to preserve the lives of those on the boat. Yursa and her sister won their real gold medals that night. God knew this would happen. He knows everything that happens. And because He loves the people of the world He insured that Yursa and her sister climbed on board the very boat that would have engine problems so they could bring the craft to shore and save the lives of men, women and children on board. Like a conductor who keeps the entire orchestra together with his baton in a performance, so also God considers each person in his over arching plan. God loves you. Even if you have experienced trials so huge you are like Yursa who was stranded in the Aegean sea without a motor, God will be with you. The Apostle Paul suffered a shipwreck more than once. Off the coast of Malta, he helped the captain and guards understand that God would protect them. Every person was accounted for on the island. Not one perished. This post has been brought to you by the one-word- Rescued. Mary, thank you for posting the UTube. Not too many 'words' come to mind while viewing it---just emotion! Very important post. Hope that you have a great day! Thank you, Mary. For me, I saw an amazing strength in her. Something the Apostle Paul must have had in his shipwreck time. I long to have that same strength when the impossibles smack me in the face...don't you? These words from a song just came to mind: Sometimes God calms the storm..sometimes He calms the Child. So true. If we let Him. Thank you. Bloggers don't often notice when videos are taken down from their resource, especially when the post drifted back in time. I appreciate your comment and have placed a new video in the spot.